Complete Redesign of the EA-Approved LRT Connection at Kennedy Station: The most complex aspect of the conceptual design work on the LRT was the connection at Kennedy Station. The recommended solution, shown in the attachments in plan and cross-section views, consisted of a large one-way LRT loop with the LRT station directly on top of the Eglinton Crosstown LRT (ECLRT) station. As Metrolinx’s plans for the ECLRT were finalised after Council approved subway technology in October 2013, they did not make any provision to protect for the LRT connection. This LRT connection is now physically precluded by the current ECLRT plans and an entirely new design would have to be developed. The “attached plan and cross section” were not actually included in the version of the document I received, but they do appear in the documentation from the original Environmental Assessment. In plan views below, there would have been three parts to the LRT connection at Kennedy. The Scarborough line (red) would make a wide loop using the Hydro corridor and swing east parallel to the north side of the existing structure. The Eglinton line (now Crosstown, blue) would enter a tunnel west of Kennedy and run alongside the subway structure below the Scarborough line (this layout is shown in cross section below). The Scarborough-Malvern line (now Crosstown East, green) would have its own station on the east side of the rail corridor at the same elevation as the Crosstown’s station to the west. The first illustration shows the design as it was presented at the March 2010 public information centre. The following drawings show an updated station design from the April 2010 public information session. It includes the location of a temporary bus terminal. The design for the approach structure of the Crosstown into Kennedy Station. The cross section below looks east through the existing station and the proposed new LRT platforms and temporary bus terminal. The Scarborough line would be at concourse level, and transfers from it to the subway would involve walking south into the existing concourse and then down a stair, escalator or elevator to subway level. This is a much simpler arrangement than now exists for the SRT. The Crosstown station would be at subway level. Transfers to/from the Scarborough line would involve going up or down one level much like St. George Station. Transfers from the Crosstown to the subway would require going up to the concourse, walking south and down one level to the subway. The temporary bus terminal would be located in the existing south parking lot, and would be connected to the existing concourse level by a tunnel. The Crosstown East (Scarborough-Malvern) does not appear in this drawing as it is further east “behind” the section depicted here. The cross section below looks north through the station and shows the position of the Crosstown East relative to the other lines. Transfer moves to/from the Crosstown East line would require a walk at concourse level and moves up/down to subway/Crosstown level. This design did not provide for through service from the main Crosstown line to Crosstown East, and the link between the Crosstown level and the Scarborough line was intended only for carhouse trips, not as a regular through operation. When Toronto opted against the LRT plan, Metrolinx changed the design of the station so that the Crosstown is now on the concourse level formerly used by the Scarborough route and there is now no provision for the SLRT in the station. The state of station design is in some flux as this is also intended to be a significant GO/RER/SmartTrack station, and it is unclear what provisions will be made for circulation between various lines serving this location. The drawings below are taken from GO’s proposal for expansion of the Stouffville Corridor. These predate any discussion of SmartTrack and the additional passenger volumes it might entail. 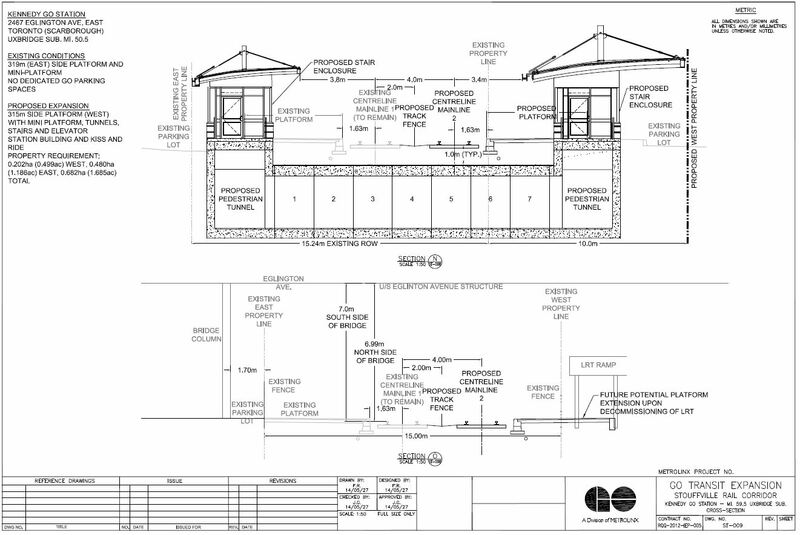 Note that the cross section shown below indicates that there is a conflict between the location of a future platform and the existing SRT structure (here called “LRT”). 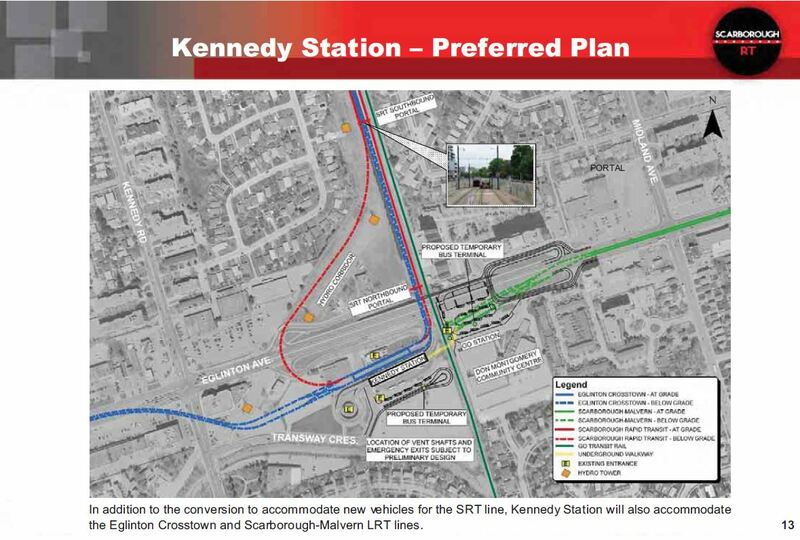 With the Crosstown East line back on the table, and the need for a physical connection between it and the main part of the Crosstown, some redesign of Kennedy Station will be required whether the Scarborough LRT is built or not. The real question here is how much redesign is needed to accommodate all five of the lines that would serve this station, and whether this is worth the effort given the obvious “hub” function such a station would have. New Ridership Forecasts: As with the subway extension, ridership forecasts for the LRT would have to be updated using the City’s new forecasting model and reflect changes in the transit network in Scarborough. This would include Smart Track/RER – with several options re service frequency and assumed level of fare integration – and options with and without the Sheppard East LRT and the easterly extension of the ECLRT. The real issue with any ridership forecast is the presumed level of service on various parts of the network and the land use patterns (employment and population) that generate travel in the future network. It should be self-evident that taking the Scarborough LRT all the way to Malvern will encourage ridership that would otherwise have to make a bus connection into the subway at STC, but we have never seen a demand model of this configuration to know how well it would perform. Similarly, with the retention of a TTC local service in the SRT corridor parallel to the railway, the need for a SmartTrack station at Lawrence East disappears (indeed it is not physically possible, see below), and this will change ridership distribution between the TTC and GO/SmartTrack services. Review Potential Conflicts with GO/RER: A new design concept for a Lawrence LRT station must be developed that incorporates the current plans for a Smart Track Station at Lawrence Avenue. 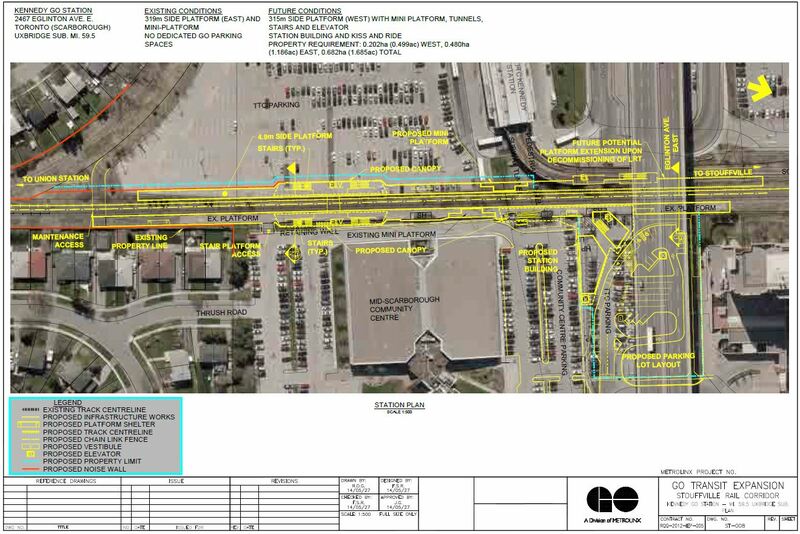 In addition to identifying and resolving any issues at Lawrence Station, the LRT plans would have to reviewed with Metrolinx to and identify and resolve any conflicts as the running structure is in the same corridor. No, it does not require a new Lawrence East Station. That SmartTrack station only exists in plans because the corresponding stop was dropped from the subway line. With the LRT line replacing the SRT, there is no reason it could not stop at Lawrence East (just as the SRT will co-exist with the double-tracked GO line). This error is important to catch because it implies an LRT/ST conflict that need not exist, but may have been invented to downplay the LRT option. Assess LRT Maintenance and Storage Facility (MSF) Options: Subject to confirmation of a consistent maintenance/operating/ownership model for three LRT lines in Scarborough, an adequate location for MSF facility would have to be identified. This could mean an interim solution (eg. a Bellamy yard was included in the original LRT EA) with a future consolidation at the previously planned Sheppard/Conlins yard. The Malvern LRT extension shown below had provision for a yard shown as “E” in the diagram below. Of course it also had stops at Bellamy, Centennial, Sheppard and Malvern Centre that do not receive any rapid transit service from the subway option. The diagram below is a closeup of the Bellamy Yard area. 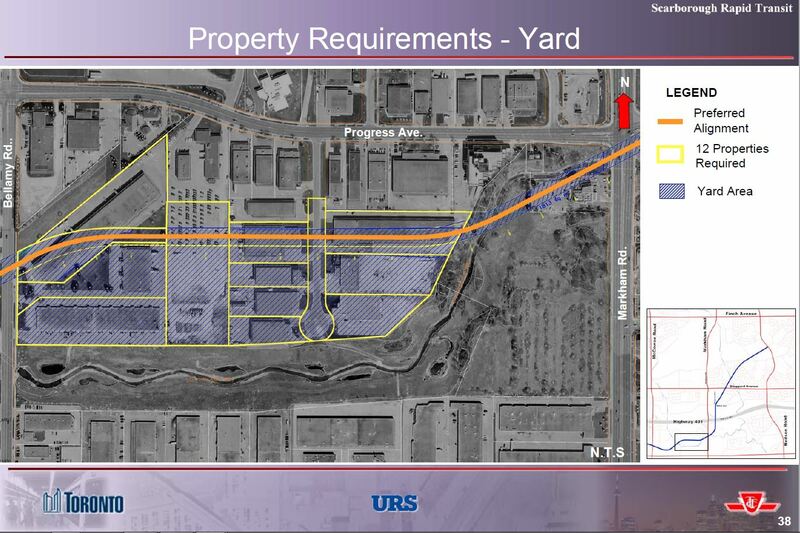 This was dropped from the SLRT proposal when Conlins Yard on Sheppard became a better site for a yard in the northeast, but in a pinch, the Bellamy Yard can still be built. Closure of Line 3: finalise plans for the bus replacement service when Line 3 is shut down, including the associated temporary bus terminals and storage facility. The whole issue of an SRT shutdown for construction cannot be avoided, but this is common not just to the LRT plan, but to subway schemes that would follow the SRT alignment. During the LRT/subway debate, it suited subway proponents to cite as long a period as possible, typically four years, while Metrolinx hoped to require less than three. Some work, notably the Malvern extension and Bellamy Yard, can be prebuilt, or at least started earlier than the rest of the line, and this needs to be built into the overall schedule. Re-examine Bus Terminal Concepts at Stations: The previous number of bus bays to be confirmed for all stations. This is not a show-stopping review. If anything, we should expect smaller terminals, some of which may already have gone through preliminary design during the original LRT project. From the point Council directs staff to proceed with an LRT solution, a very rough estimate would be that it would take approximately 12 to 18 months to present a revised plan to obtain Council and MOE approval. This is very much dependent upon the time required to identify, and obtain acceptance of, a new connection at Kennedy Station. 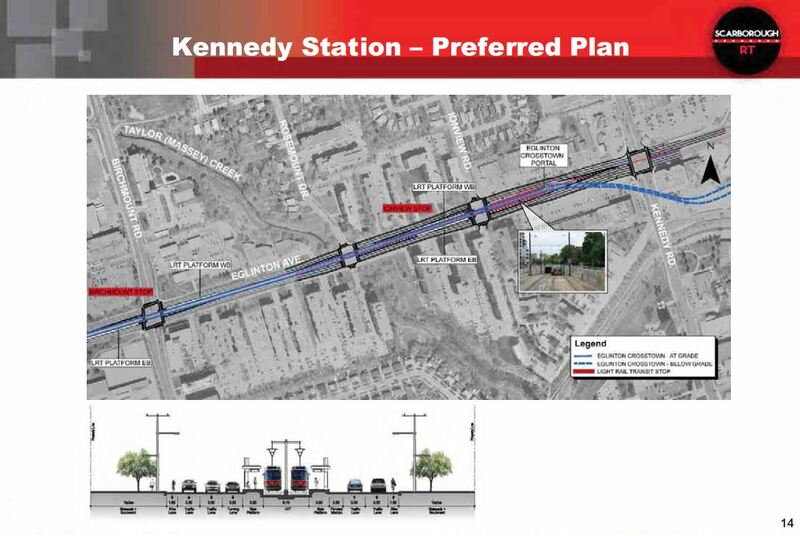 The construction at Kennedy Station is the key element on the critical path for the LRT and depending if the preferred design is above or below grade, construction could range from approximately 3.5 to 5 years. If staff are directed to proceed in July 2016 and assuming construction cannot begin before the ECLRT work at Kennedy is completed in 2021, a quick preliminary evaluation suggests the LRT could be operational in early 2026 to late 2027. The assumption that work must await the Crosstown’s opening in 2021 creates an artificial constraint on its start date. It is self evident that any work at Kennedy Station will include the new SLRT station, not just the Crosstown, if they are to be physically on top of each other. The TTC appears to have taken the worst case scenario, rather than approach of saying “how can we consolidate timelines for the two projects”. The October 2013 Council report indicated the Province had announced $1.8B ($2010) for construction of SRT as LRT, to Sheppard. Of the $1.8B, the Province committed $1.48B ($2010) to the SSE. As a minimum, staff believe the $1.8B should be the starting point, which would have to be updated through proper design to address the changes noted above. The $1.48B has recently been reported as the total cost of a seven stop LRT. To facilitate a high level cost comparison of the current subway estimate to the costs of an LRT at this time, the $1.8B was escalated to an end of 2025 opening (2% per year from 2011 to 2013 and 4% per year from 2014 to mid-2023), adding SRT Life Extension and SRT Shutdown service. The SRT shutdown costs are common to all scenarios, although their actual value depends on when this occurs because inflation will affect the cost. 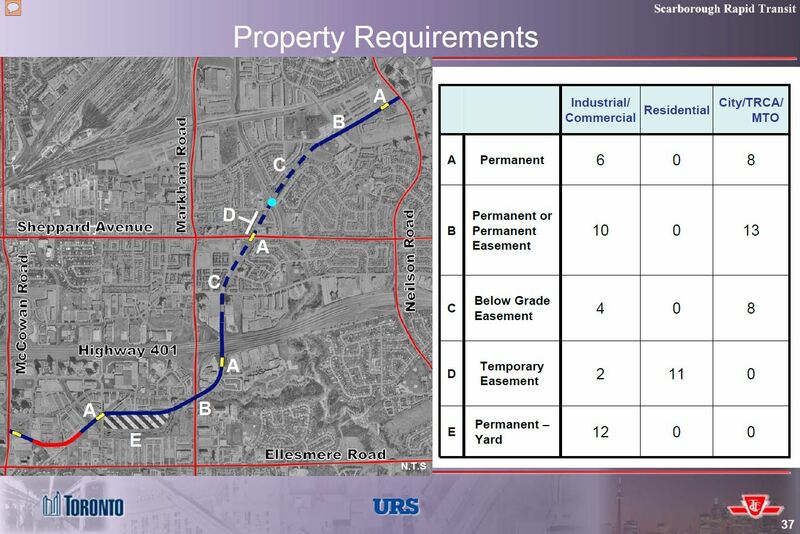 Moreover, demolition of the existing SRT will be an integral part of building any new line in the SRT corridor, and some structures may be retained and adapted. The TTC does not examine the effect of alternatives in project staging nor the interaction between the timing of project elements. Improved coverage for Scarborough travel with the LRT plan provides better access and offsets some bus feeder costs (better return for investment). The time-to-construct may be overstated by two years due to the artificial delay awaiting completion of the Crosstown. Starting sooner on the LRT saves on inflation costs at 4% per year (TTC’s factor). Full demolition of the SRT partly duplicates some work that an LRT in that corridor would do anyhow, and presumes none of the existing structures, notably stations, would be adapted/reused. The cost of a bus shuttle to replace the SRT during construction depends on the length of the shutdown which is probably overstated by TTC. Metrolinx expected to make the conversion in under three years, not the four years typically cited by subway proponents. SRT life extension costs are based on keeping it running until the subway opens. The LRT project would close it sooner thereby shortening the “life extension” period. Elimination of Lawrence East SmartTrack station would save on costs that would otherwise be part of the ST project. Note also that ST requires an early shutdown of the SRT because of physical conflicts. I have no illusion that a return to the LRT option for Scarborough will be an easy or even a likely political decision, and it would only be forced by a financial constraint with the subway plan that Council simply could not stomach. Moving away from the subway option would be a huge political step back for some members of Council and for the Mayor, not to mention the provincial pols who have supported this plan. The entire situation is made even messier by the scurrilous allegations about the motives of LRT advocates, and the outright lies told about LRT’s effects and capabilities. The TTC for its part seems to be presenting a worst case scenario for the LRT option. Whether this is tailored to suit the political climate is unclear, but it is certainly not the work of an organization eager to pursue the LRT option. The great shame for Toronto’s transit debates in general is that this has become much more a matter of faith both in one technology over another, and in a picture of Scarborough’s future travel that does not match how that part of Toronto actually operates. A set of the 2010 Environmental Assessment reports for the original LRT proposal is available on this site. That page has been updated to include the display boards from the March and April 2010 public information centres. A couple of questions: Why does the Scarborough LRT need a turning loop? Is there a reason the Crosstown doesn’t go through, like unmovable infrastructure under Midland Ave or something? Steve: The loop configuration allows the SLRT to have all loading directly from the concourse level without the need for vertical access to a centre platform. The lack of a through connection was, I think, meant to save money although from the station layout it should be possible to build. If the Sheppard East LRT and Conlins Yard existed, the Scarborough-Malvern Line (Crosstown East) could be served from the north rather than through-routing to Eglinton-Crosstown. I don’t want to get my hopes up too much but this talk of going back to the LRT is encouraging. If they do keep looking at it despite the $3 billion price tag maybe it turns out that Kennedy Station could be renovated in one go instead of two. In that case, would the LRT could come in years earlier and hundreds of millions cheaper? Maybe a redesign of Kennedy Station would put Scarborough LRT on the same level as Line 2, and deep enough to allow the Crosstown to do through service to Crosstown East. If they do that then it would make sense to build the Scarborough Line platform first since it would be on the bottom. Steve: The arrangement of platforms at Kennedy depends in part of which transfer moves you want to make the simplest. Only with the upper level loop is the simplified SLRT to subway transfer possible. Such a ridiculous design and all the outsiders can do is dig up an old flawed plan. SCC is a growth node and should not be isolated one stop before. It’s bad design. Period. Sheppard actually creates an extra transfer to the stub. Period. How about finding alternative designs to integrate Scarborough instead of this same divisive plan. Steve: The joke is that Scarborough will wind up with a much worse network with the one-stop subway. Scarborough is NOT just the Town Centre, no matter how much hot air might come out of City Planning on this. Integrating Scarborough requires that network designers look at more than STC. As for this article, the point was to show what the LRT plan had been because there has been a lot of mis-information about it. You may not like this plan, but at least the discussion should start from what was actually proposed, not from the invented, false claims of LRT opponents. Like you , and many others, I was really quite upset by the Mayor’s op-ed comments last week implying that because I think a $3+ billion one-stop subway is a waste of money I am a racist. As I told him in a letter, my concern (which is shared by many) is that spending $3+ billion on transit in Scarborough is just fine IF it is spent effectively and will actually give Scarborough a useful and efficient transit system. Saying that “Scarborough deserves a subway’ is simply foolish and demonstrates a complete lack of leadership. Let’s imagine for a moment that council reverted back to the LRT plan, and the SLRT was built to Malvern alongside a Sheppard LRT to the zoo and an SMLRT to Sheppard (Malvern as well?). Now let’s assume there’s money left over and (for political reasons or otherwise) it can only be spent in Scarborough. What’s the next logical project? Is it LRT or BRT on Lawrence East? Markham road? Warden? McCowan north? What is Scarborough leaving on the table by pursuing the one stop subway, beyond what’s already planned? Steve: I think that your menu of LRT lines will more than consume the “committed” funds already in place, and so your question is moot. It would be nice to get back to talking about the city west of Victoria Park. At this point, what tabled plans involve replacing the SRT with bus shuttle service for multiple years? In my opinion all of these plans are non-starters, no matter what the price of the alternatives. The only plans that make sense require the SRT to continue running alongside construction. Steve: That is physically impossible if the existing corridor will be recycled for anything else. Does the existing subway plan reclaim any part of the existing corridor (such that a such down of SRT would be required during construction)? Do any LRT configurations run in a different corridor to the SRT? Steve: The current subway plan via McCowan dos not use the existing corridor, and there is only one LRT plan. Oh, what a tangled web … and big thanks again to you Steve for massive outpourings of lucid and detailed analyses, tho many of us don’t digest them fully. And so given all of the massive changes and the differing points of view, the Hurry Up and Make More Mistakes agenda of Tory etc. to put a stamp of approval on the various ‘ideas’ (can’t call them plans, nor are they necessarily schemes) may be very wrong, and perhaps a special meeting of Council/Clowncil should be held, and not push everything along in mid-July, as other issues will suffer too. It’s wrong to shove it all through to enable summer vacations, and we almost need a reset. To the substance: at times there’s a very strong sense of the TTC/bureaucracy simply being unwilling to entertain new ideas that don’t reflect what they want to have happen. Imagine a new idea arising? Like this Smart Spur option – how impossible is it to have buses deliver the service for some months while there’s a real push (including double-shifts) to do things. And I know that there’s a lot of tiring work in heavy construction and protocols need to be followed, and our weather extremes are brrrutal at times and over-heated at others, so it’s hard to have all the tonnages move around like electrons do. Could portions of the Gatineau hydro corridor be used for a busway in any temp service? And yes, I’m biased to including this in Scarborough transit options – it could be 401 relief too, as it touches on the 401 in the east and leads to Eglinton area at Victoria Park. What an enormous and costly mess this is becoming eh? Fordwards was very backwards for the taxpayers, and we could really use some fiscal conservativism, recognizing that transit is needed in all of Caronto, and automobility is far more subsidized than transit, just the costs are well buried in all parts of the budgets. At this point, might as well just upgrade the RT to Vancouver-style Skytrain. If we end up will LRT, why can’t it be routed as follows: Crosstown and Eglinton east through-routed at concourse level, SLRT cross-platform interchange with the BD? 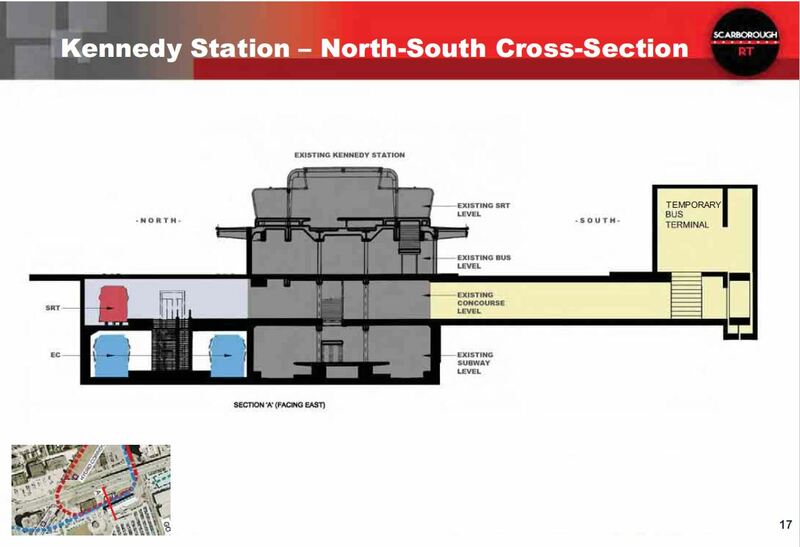 I noticed what might be interpreted as an unfortunate mistake in the Kennedy Station North-South Cross-section diagram. The ‘new’ SRT line depicts a vehicle that is physically smaller than those on the Crosstown line. Obviously this isn’t true, but I’m surprised that none of the Scarborough Subway hotheads jumped all over this as part of a (conspiracy) plan to give them ‘less’. The irony is that they could have had a perfectly functional network of LRT decades ago using such vehicles, and the conversation now would be very different. One member of the public writing in to The Star today managed to elegantly frame this extraordinary waste of money in a visual scale we should all be able to grasp – The cost for the one-stop subway is already half the total cost of the project to expand the Panama Canal! Inevitably it will climb higher. Some of the subway supporters might like us to believe their cause has a similar value to the billions of dollars in annual commercial shipping trade plying said canal. The reality couldn’t be further from the truth. Steve: Very large Swan Boats! One option that I can’t remember seeing discussed is an alternative, on-street LRT alignment. Do any of the NS Scarborough arterial have sufficient ROW to accommodate a median LRT, (branching north from the Crosstown East)? While median-running would be an operational step down from the SRT ROW, the need for bus replacement could be avoided and the route could more effectively serve local demand than the SRT. Steve: There has never been an on-street proposal because the LRT was always intended to run in the same corridor as the SRT. Median running would inevitably be slower because some intermediate cross streets cannot be avoided, and there would also be issues with pedestrian movements at stations, notably at Lawrence. If you want to actually add stops compared to the SRT, this raises the question of just where there is a location significant enough to warrant this, particularly as this would be seen as a further degradation of the LRT option compared to subway. This is not an effort, but I think the point Steve was to show this can be done. As for the subway, they should consider doing it above ground at least. I think that the subway plan is better for most people. The Lawrence stop definitely needs to be readded, but the subway plan provides reduced travel times for people going to Scarborough Centre which is the vast majority of people who will use this line, by eliminating the transfer at Kennedy for people coming from near Bloor & Yonge. The travel time to Centennial College or Markham & Sheppard is roughly the same with both the subway and LRT plans, because the subway requires a transfer to the bus at Scarborough Centre while the LRT requires a transfer at Kennedy. It takes too long to get from downtown or nearby areas to Scarborough Centre and the subway along with “SmartTrack” and Eglinton LRT will significantly reduce it. It doesn’t seem like the cost difference between the two plans is enormous, given that all transit projects have cost overruns. I think that Josh Matlow is mistaken if he thinks that cancelling the Scarborough subway will pay for more than a tiny fraction of the cost of the downtown relief line. The cost increase in the Scarborough subway is only a small percentage of the original estimate whereas the cost increase for the Downtown Relief Line subway is over 150% and so if the cost increase were to knock either project down, I expect it to be the latter and I have faith that Mayor John Tory will not betray the people of Scarborough him being the only Downtowner that we trust. Steve: The “increase” for the relief line is primarily due to a change in scope and a longer delivery timeframe, hence more inflation. The base price has not changed very much. But details like that probably don’t trouble you. There has never been an on-street proposal because the LRT was always intended to run in the same corridor as the SRT. Median running would inevitably be slower because some intermediate cross streets cannot be avoided, and there would also be issues with pedestrian movements at stations, notably at Lawrence. If you want to actually add stops compared to the SRT, this raises the question of just where there is a location significant enough to warrant this, particularly as this would be seen as a further degradation of the LRT option compared to subway. I don’t want to push the argument too far. My intent to explore the idea, not advocate for it. My thought was that the degradation could be mitigated (somewhat) by selective grade-separation. 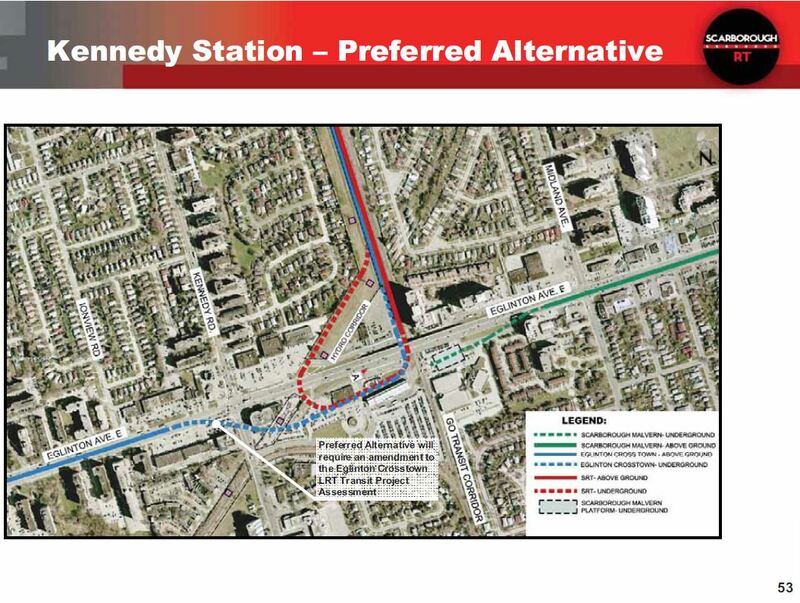 The portal east of Kennedy could be shifted to ~Brimley, Lawrence could be overpassed (with pedestrian connections to the plaza and hospital campus), and a brief tunnel could be built from south of Ellesmere to STC. I’d imagined tbd midblock stations, but there really isn’t a whole lot to service. In practice, the line might only stop at the three originally planned subway locations. The Scarborough Subway is going to make the Sheppard Stubway seem like a bargain! I had to use the dictionary to find “scurrilous.” Am I correct that you’re referring to Duguid, De Baeremaeker, Tory, et al., alleging evil motives at anyone who disagrees with the One Stop Extension? There were multiple deputants from Scarborough who spoke in favour of the 7-Stop LRT at the Exec Comm meeting last week. Somehow these speakers had vanished from the mind of Glenn De Baeremaeker when he made his “wall of hatred” comment. Steve: Such people are invisible to the subway proponents, or are clearly interlopers from another galaxy. The joke is we can’t have an intelligent plan. Or we revert back to one bad Political plan when the other Political plan hits a snag instead of looking for a compromised solution. The subway can go above ground just like an LRT can without the poorly located transfer. Surely there are a few extra cost in re-engineering above the LRT. But certainly not close to the costs of the underground proposal and much add more value than both plans. Ok, I am just a savage living in the middle of a forest, but I was wondering, if common sense prevails, could not the subway route instead be the route of the LRT? In other words, run an LRT above ground along the same path, more or less, as the subway extension. Not much digging, save maybe $2.5 billion (cough) taxpayers’ money, keep the SRT running in the meantime, go east from Kennedy Station on the same track as Crosstown (Eglinton) East and veer off at Danforth Road, maybe loop the LRT around Scarborough Town Centre with a stop on the south side and another on the north side, extend it on McCowan underneath the 401 overpass to Sheppard, and maybe further. Hmmm? Steve: The whole point of the LRT staying in the RT corridor is to get comparable speeds and travel times, especially considering projected demand in the 8k range. If the line runs in the middle of Eglinton, Danforth Road and McCowan, this will not be possible. Just forget about the scarborough lrt and the subway extension. Just keep the Scarborough RT running. These plans gives me headache. Where are we at this time? The extended LRT is under the service road, two levels below grade on a plane parallel to the subway. The extended LRT must surface onto Eglinton while the Subway must curve under the rising LRT and proceed under Eglinton. This will require some fancy engineering and expensive construction costs. Steve: The extended LRT (Crosstown East) is north of the subway structure and will surface faster given that LRT can handle steeper grades. This should not be a complex engineering problem at all. I just watched the 3.5-minute video of Deputy Mayor De Baeremaeker speaking in favour of the Scarborough Subway and mentioning the (metaphorical?) “Wall of Hatred” built up by all those folks west of Victoria Park Avenue (according to him). He wants to build a subway (his love train?) that will just blast through that nasty wall! He points out that North York has 15 subway stations, but that’s not what I see when I look at a TTC map and a map of North York’s boundaries: I get 5 along Allen Rd., 4 on Yonge St. and 4 on Sheppard Avenue. Note that Eglinton Station on Allen Rd. and Lawrence Station on the Yonge Line don’t count because they *don’t* fall within the North York boundaries and Yonge/Sheppard is counted only once. I’m also not sure if the Deputy Mayor is including stations that are part of the Toronto-York Spadina Subway Extension – because there are going to be 4 new ones that fall within North York’s official boundaries. Creative (ac)counting on his part. But Steve, am I missing something here? He claims that Toronto City staff have indicated that the LRT will (now) cost $2.7 to $3 Billion dollars, which is – in his words – comparable to the $3+ Billion that the one-stop subway project will cost, so why are we quibbling about pennies? Didn’t the Province agree to pay the costs for the LRT, plus ongoing maintenance, etc., etc.? And isn’t that agreement still valid (i.e. it hasn’t officially been torn up), even though nobody is actively moving on it or even mentioning it for fear of blasphemy claims? Mind you, Brad Duguid (and others previously mentioned elsewhere throughout this blog), claim that all the folks west of Victoria Park Ave. – those “downtown elites” (but not the folks in Rexdale or South Etobicoke, for example) – who already have all the transit you can imagine, is actively putting more bricks into the “wall of hatred” and keeping Scarberians from accessing the downtown core. He doesn’t mention the fact that an LRT network in the right places throughout Scarborough would actually help folks who aren’t going to be anywhere near the Scarborough Stubway Extension once it’s built and will still be riding buses to the Town Centre…. The hyperbole is worthy of an American election campaign and somebody needs to stand up in the public sphere – in person – and shout them down for lying, lying, lying. But hey, as Donald Trump has shown, if people like what you’re selling – even if it’s pixie dust and unicorn farts – they’ll clamour for more. Steve: I have already written about the briefing note regarding the cost of reviving the LRT proposal, and my feeling is that the $2.7-3.0b estimate is inflated. In any event, the subway is well over $3b and the difference between the two schemes could still be as much as $1b. I have completely given up on expecting GDB to say anything accurate or rational. 1) Pay Bombardier to put Mark-I cars into production to replace the fleet. 2) Purchase the newest version of the cars and modify the line so they can be used. 3) Replace the line with LRT. Choice 1 is the closest to the suggestion above, but what do we do in 30-35 years when the replacement fleet is at the end of its life? Choice 2 would make the line usable for future versions of the cars, but the cost per kilometre would be so high we will never extend the line. Choice 3 gives us the replacement that can be extended for a reasonable cost, allowing it to reach more without the need for a bus connection sooner. I find it amazing that the plan that Scarborough Council voted in favour of on April 1, 1974 is being reconsidered. If only the Province and Bill Davis had not tried to invent a new technology that would make Ontario the World Leaders in Intermediate Capacity Transit Systems this line would have been running for over 35 years now. Ifs and buts … What a tragedy. I agree with those here that think a compromise is possibles between the continuous and fast, but expensive subway and the cheaper and more stops, but slower and disjointed LRT. The information provided seems to indicate that at best, no transit would be built until 2024. The question then to ask is whether a compromise can be found that takes the best of both ideas. As Vancouver has found, the answer lies in elevation. The condo developments at STC show us that people do not necessarily dislike elevation. The lesson from Davenport grade-separation is that if an elevated line is to be put through a neighbourhood, then they must be given a station. The simple addition of a St. Clair station would have solved all the Barrie line naysayers. Also of importance is to not put an elevated line where they are expecting underdround transit, and have a few optional routes so that if one group does not want elevated, then the choice is a different alignment, and not underground transit. I bet if I started drawing lines on a map, the SRT could be “extended” west to the Don Valley, then south with a few stops, and across downtown to the Exhibition. This would be about 20 to 25km, and using Vancouver pricing, the cost would be about $4B – very similar to the 3 stop subway. It also reduces crowding at Y-B, instead of adding to it, and it would cross Eglinton, DRL, B-D, YUS and RER. The completion date would be no different than the subway. I have always said that the planners should find alternatives that meet the goals of the political proposals. Instead, they just fudge the numbers to match the political proposals. They say that when Council changed its mind, to favour subways over the provincially-funded LRT, they had to scrap the plans and make new ones for building the subway. They seem to indicate that those LRT plans must be updated and the Kennedy station modifications need to be changed (again). But, have they actually done any work on the station? If not, what has changed that we can no longer pull out and use the LRT plans and studies? I know that SmartTrack is new and no doubt its effect must be accounted for, but would it cost THAT much to update? I don’t have an engineering or planning background, but it sounds like they just “threw out” the LRT studies and now have to re-do them from scratch. Steve: With the decision to move to a subway, the station became much simpler from Metrolinx’ point of view because they no longer needed to make provision for the Scarborough LRT line. This affected both the station layout as a terminus, and the approach path taken by the tunnel leading to the portal west of Kennedy. That is the version tendered by Metrolinx, and reverting to the “original” layout would require (a) advancing the original design to tender-ready status and (b) issuing a change order for the new station layout. No actual work has started yet. As for SmartTrack, there was already a conflict between a proposed second platform at Kennedy GO Station and the existing SRT structure. This would have been eliminated because the LRT loop would be underground rather than accessed via a ramp up to the top level at Kennedy. There are potential conflicts for GO/RER at Kennedy, and for SmartTrack at Lawrence East between the GO/ST structures and the existing SRT that could trigger the much-hated early shutdown of the SRT. With the construction date for the subway drifting into the mid-2020s, this is a growing, if not yet fully appreciated, problem. I support the idea of LRT in general. I also support building something now, rather than endless changing of plans. I live in Scarborough, and I took transit for several recent years. Kennedy Station is one of the busiest stations in the network, and at least a third of the riders who leave the subway take the SRT to STC. There are about 20 bus routes leaving Kennedy, and at peak they have about 100 buses per hour. When the SRT goes down, the bus replacements overload the station capacity. The SRT is almost dead, and a replacement is critical. Buses will not do, and time is more critical than money at this point in time. The LRT replacement for the SRT had its plans at the 60% stage, and was ready for construction in 2010, before Rob Ford. With his flip-flops the plans were put on hold. When council reinstated Transit City they were revived. And when council flipped again and decided for a subway instead of an LRT, Metrolinx ended the LRT team, and the province got ready to fund the subway instead, with TTC doing the design. With the Kennedy Station plans evolving, a re-instatement of the LRT could now be inconsistent with the station design. TTC is doing the subway design. The LRT would probably go back to Metrolinx. This adds years to the timing, and wastes millions of dollars in designs. We need to get new transit built, sooner rather than later. The endless arguments over preferred designs waste time and money. Proceed with something now please. Well, Mayor Tory was on CBC this morning and trotted out some of the lines that certain commentators here like to use. Perhaps they are his brain trust. One claim he repeated several times is that Scarborough is the only suburban city centre without higher-order rapid transit. Well, even the Eglinton Crosstown is LRT, and a pretty identical LRT is being proposed for STC, so Tory/brain trust forgot about York, and they certainly didn’t think about East York. But what’s really noticeable is the claim — made here, and also explicitly by Tory — is that “Etobicoke city centre” has subway service. The old Etobicoke City Hall, now Civic Centre, is on West Mall, a good three or four kilometres from a subway, and with no chance of a subway station any time in the 21st century. What’s called “Etobicoke City Centre” these days is the area around Kipling station, but the station came well before there was anything of note at Six Points beyond the Westwood theatre and Apache burgers. To use the language of media geeks, “Etobicoke City Centre” is a retcon: the subway ended at Kipling, so let’s make this the city centre. (Which it is not, anyway: certainly STC can make a much better claim to being a “City Centre” than the few condos and Tim Hortons/Wendys that is all that’s around Kipling and the six points. Scarborough could easily have subway service to its “City Centre” if that had been declared to be at Kennedy and Eglinton. It would be the same kind of City Centre as Etobicoke has, and it would be connected to the subway and GO network today. I’m getting tired of Tory sounding like the Scarborough troll commenters here. I spent the weekend digesting the material you made available in your 5 articles before the long weekend. Whewh! It appears now that the SRT has been demoted to ‘keep it limping along – somehow’ status, because all the funds are going to the Express Subway to Scarborough Centre and the revived/revised UTSC LRT (nee Malvern LRT). When these projects are done, SRT will be over-due for replacement or scrapping. What occurred to me is that after the new Scarborough Subway & UTSC LRT are running, the SRT can be shut down to have its Kennedy terminal rebuilt as a single platform at the Concourse level – but running North-South (parallel to the GO tracks). The ramp up to the current upper SRT platforms will have to be demolished to do this, and be replaced with a ramp down to the Concourse level platform, with a portal north of Eglinton. The rest of the line shouldn’t need to have major changes made to it. With the problematic curve east of the current SRT platforms no longer an issue, the aging UTDC cars can be replaced with Mark III (or newer) 2-car or 3-car trains, still running the LIM propulsion. If the SRT extension eastwards is also included in this project, a new storage yard & maintenance shop can be built at the new end-of-the-line, and the existing McCowan yard/shop can be rebuilt as a storage yard. This rebuild of the Kennedy SRT terminal would likely be a lot faster than retrofitting the entire line to run Flexity LRTs, since the rest of the existing stations would likely need fewer changes to handle the newest Bombardier cars. You seem to have missed the point that the SSE is intended to replace the SRT. There is no way that an RT replacement would be created once the subway extension is running. A minor reason is that it would still leave the TTC with a technology that is restricted to a single short line but that requires separate shops and staff to maintain and repair. The numbers following the brackets are the daily TTC Ridership numbers for 2012-2013, which indicate daily boardings in the region of 16000-17000. Since ICTS capacity is considered to be between 15000 and 30000 pphpd, a rebuilt RT is totally unsuitable. Steve: ICTS may be able to provide subway-like capacity in theory, but only with a large fleet and very frequent service. 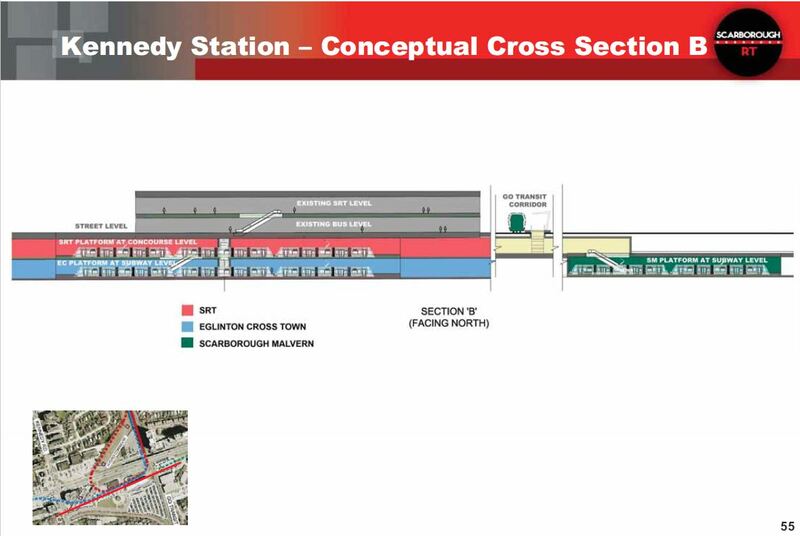 One very significant cost element is the fact that the Eglinton Crosstown contract is already awarded, and is based on the current design of the Kennedy Station. It is a multi-billion dollar Design-Build-Finance-Maintain contract. Any scope changes after the award can have huge financial impacts.